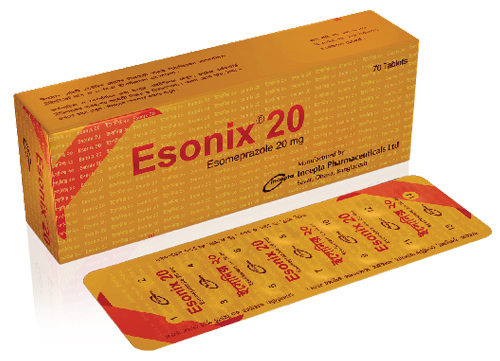 Esonix 20 tablet: Each delayed release tablet contains Esomeprazole Magnesium Trihydrate BP equivalent to Esomeprazole 20 mg.
Esonix 40 tablet: Each delayed release tablet contains Esomeprazole Magnesium Trihydrate BP equivalent to Esomeprazole 40 mg.
Esonix 20 capsule: Each delayed release capsule contains Esomeprazole Magnesium Trihydrate BP equivalent to Esomeprazole 20 mg.
Esonix 40 capsule: Each delayed release capsule contains Esomeprazole Magnesium Trihydrate BP equivalent to Esomeprazole 40 mg.
Esonix 20 delayed-release oral suspension : Each sachet contains Esomeprazole Magnesium Trihydrate BP equivalent to Esomeprazole 20 mg.
Esonix 20 IV Injection: Each vial contains sterile lyophilized powder of Esomeprazole Sodium INN equivalent to Esomeprazole 20 mg.
Esonix 40 IV Injection: Each vial contains sterile lyophilized powder of Esomeprazole Sodium INN equivalent to Esomeprazole 40 mg.
Esomeprazole (Esonix) is a proton pump inhibitor that suppresses gastric acid secretion by specific inhibition of the H+/K+ATPase in the gastric parietal cell. 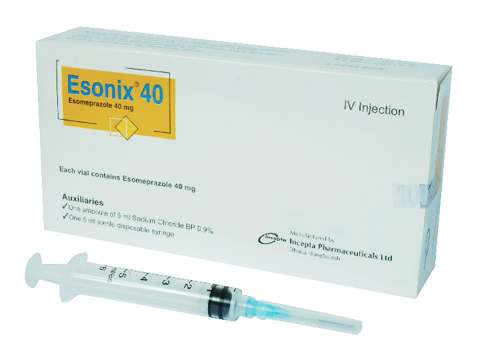 By acting specifically on the proton pump, Esonix blocks the final step in acid production, thus reducing gastric acidity. Pediatric: Give the following doses once daily as an intravenous infusion over 10 minutes to 30 minutes. 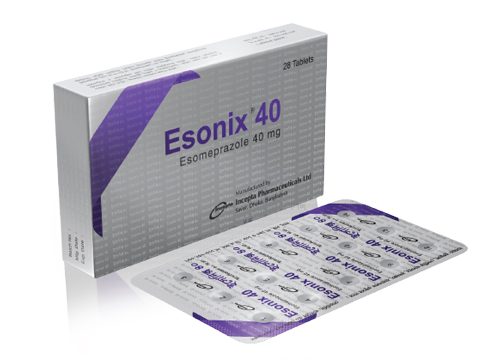 In general, Esomeprazole was well tolerated in both short- and long-term clinical trials. The most frequently occurring adverse events (>1%) are headache and diarrhea. nausea, flatulence, abdominal pain, constipation and dry mouth occurred at similar rates among patients taking Esomeprazole. Symptomatic response to therapy with Esomeprazole does not preclude the presence of gastric malignancy. Atrophic gastritis has been noted occasionally in gastric corpus biopsies from patients treated long-term with omeprazole, of which Esomeprazole is an enantiomer. In Pregnancy: Pregnancy Category C. This drug should be used during pregnancy only if clearly needed. made whether to discontinue nursing or to discontinue the drug, taking into account the importance of the drug to the mother. 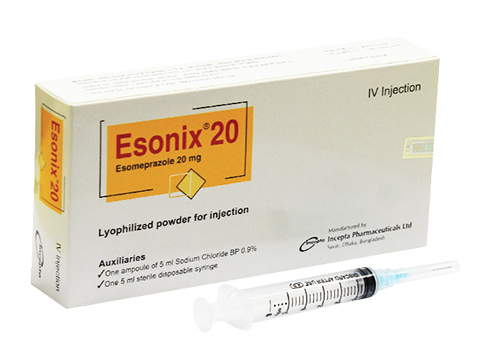 Lactation: Esomeprazole is excreted in human milk. Thus, a decision should be taken to discontinue nursing or to discontinue the drug, taking into account the importance of the drug to the mother.